In the world of commerce the assumption of equality between competing offerings can be a grave mistake. Certainly there are commodities – oil, gold, pork-bellies, etc. And even manufactured products can conform to rigorous technical specifications which can ensure comparability within reasonable parameters. Services, however, are generally another matter altogether. Typically services grow preference through a difficult marriage of personalization with consistency in the quality of performance. Straying to one side or the other can lead to dissatisfying results. Case in point, the “interesting” result from my recent haircut made plain to all that I had not visited my regular barber. While I can survive an occasional interesting haircut without enduring severe consequences, especially with the strategic use of headwear, this is not typically the case when sub-optimal business decisions regarding important services are made. In a business environment in which the pressure to minimize costs can be extreme, price and timing considerations can take on outsized importance in choosing among service providers. As a service, communications research is certainly not immune to such considerations. But we must bear in mind that research is not a commodity. Study design and methodology, sampling, operational execution, quality controls and consulting are among the important differentiating factors that impact whether or not the research provides insights that the brand team and their agency can leverage. How much of a difference can this make in terms of financials? In one notable longitudinal study the revenue growth track record of brands served by MSW●ARS was compared to the track record of brands served by other copy research suppliers. The study covered fifteen business quarters wherein each brand’s sales were compared to year ago sales to determine whether the brand had grown or not. 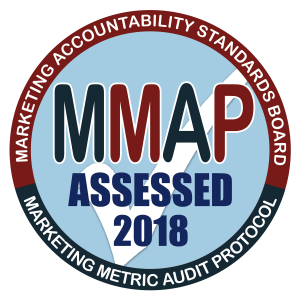 In an average quarter, nearly sixty percent of brands served by MSW•ARS experienced revenue growth. For brands served by other research suppliers the corresponding figure was under twenty-five percent. 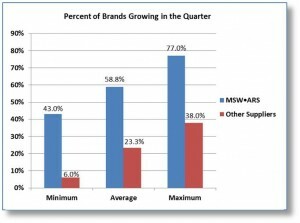 And even in the worst quarter for brands served by MSW•ARS nearly half the brands still grew. Of course brands face different environments that can impact trends in business results and all brands may at times face headwinds from a slowdown in overall business conditions. But across a pool of brands and a large number of quarterly observations, effective communications research should help brands realize topline growth more often than not. The results of this study reveal a clear trend. The brands served by MSW●ARS were consistently more likely to grow versus the prior year compared to those that we didn’t serve, providing proof that indeed not all communications research suppliers are created equal. Please contact your MSW●ARS representative for more information on how our communications research services and consulting can help improve your brand’s advertising communication and contribute to growing topline sales. Digital Just Got BIGGER – OOH!